A patio for outdoor relaxation and entertainment expands your living area, enhances your backyard, and creates a unique spot for enjoying outdoor meals and socializing. A previously dull and drab backyard can be completely transformed by the addition of a patio or deck. 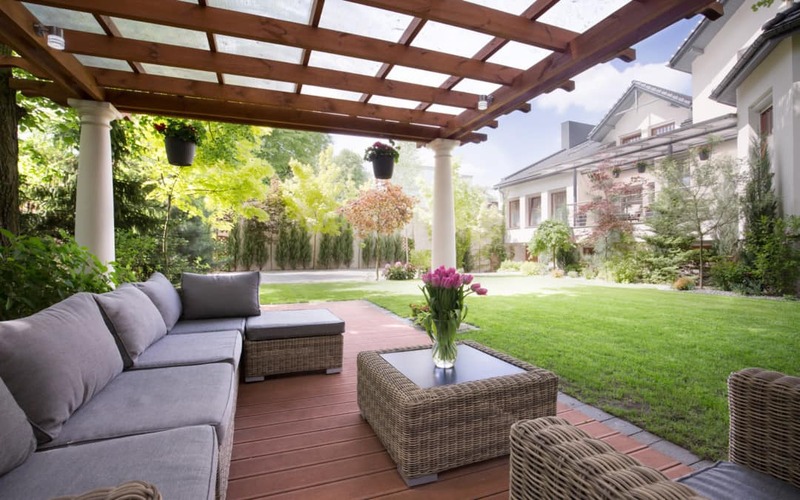 We’ve all seen photographs of dreamy backyards and idyllic patio features. A patio offers the opportunity to make outdoor living a part of your daily life. And creating a lovely patio to increase your enjoyment of the great outdoors may not be as difficult as you think. Here we look at some patio design ideas which are sure to give you inspiration and enthusiasm for a patio or deck construction project. We are well aware that the weather in the UK is not always as wonderful as we’d like it to be. Yes, it does get cold. Yes, it does rain. But a patio can be constructed in such a way to enable outdoor entertainment whatever the weather. By adding a roof or shelter, a fire pit, and gas heating your patio can be an all year round feature of your house. A fire pit can be built-in through the use of bricks and concrete blocks, or a circular metal fire pit can be used. Gas heaters come in a wide range of styles and functionality, from a street-lamp type to a traditional fireplace style. The cover for your patio can be constructed to overlay the entire area, or you may choose to erect a shelter over just one portion. Consider adding a screen, wall, or fence at one end of the patio to prevent the prevailing wind from chilling your guests. When pondering patio design ideas you can take inspiration from your local area. Do you live close to a quarry or is there a natural material which features in local buildings? Are you near a body of water or woods? By bringing a hint of nature into your patio build you can draw on your surroundings to enhance your design. Use local stone or rock, incorporate native bush and tree plantings, or replicate a nearby stream or river with a built-in water feature. The structure of your patio can be built of traditional wood and steel, but decorative additions of natural features can set your outdoor area apart. Be creative. Bring the local area into your own backyard. You may decide that you want your outdoor area to be anything but natural. Perhaps you would like to recreate a Mediterranean theme or bring a tropical backdrop into your patio design ideas. Through the clever use of furnishings, paint colors, furniture styles, and lighting you can transform your patio into a scene from anywhere in the world. Woven mats and colorful cushions can hint at a far-off bazaar and a blue and white scheme can bring the beach to your backyard. You may even decide to mix it up a little. Through the use of furnishings alone, you can change the look of your patio drastically. Keep the structure the same, but experiment with colors and textures to suit your mood. If you wish to make the most of your patio construction, it pays to give some thought to a barbecue or cooking area. A well-chosen barbecue can become a focal point of the patio. It will also add a little additional heat should that weather choose to rain on your parade. Barbecue styles range from the basic to the splendid, with price points to match. Consider how much use you expect to get from your cooking appliance. If you intend to use it regularly to feed large numbers of guests choose a barbecue that can adequately cater for a crowd. There’s nothing worse than having to wait in line for a sausage or a chop because the barbecue is not big enough to cook enough food at once. If you’re looking for something a little different in your patio design consider adding multiple levels to the area. This can be as simple as adding in a few steps or you may wish to incorporate functional areas of differing heights. The addition of steps or levels enables the patio to be effectively broken into areas. You could then choose to surprise guests with a different feature in each area. Perhaps your steps will lead to a lounging area or a small fountain? Opting to add levels to your design allows the opportunity for further creativity and imaginative enhancements. The flooring you choose for your patio can be both serviceable and attractive. Boards and planks are generally used for deck areas but stone tiles add to the overall look and appeal of a patio. You may choose small or large tiles in either solid or variegated color depending on the effect you are seeking. Consider the look you are hoping to achieve. A Mediterranean-themed patio may benefit from warm-colored tiles while a natural-look area may do better with slate. Ensure you choose a tile that will not become slippery in the wet. You do not want unexpected rain turning your patio area into an unsafe environment. Don’t forget the lighting when you are thinking of patio design ideas. The range is almost limitless. Once again, refer to the end result when you make your selection. Chinese lanterns can enhance an exotic area while stately lamps can add elegance to a traditional patio. Strings of fairy lights may be a perfect choice, or multiple candles may deliver the effect you want. Light the cooking area adequately if you intend to make outdoor cooking a large part of your patio usage. Don’t overlook the potential of good lighting. Through the use of lights, you can illuminate the areas you want to showcase and dim down other areas to add a sense of mystery. The team at Allison Decking are only too happy to help you make your patio design ideas a reality. Contact them today to talk about all your renovation and building requirements.